Happy New Year! People all over the world celebrate the end of 2013 and welcome the start of 2014. Behind the champagnes over the bar, the party on the streets, and the colourful fireworks in the sky, lingers the age old question: "What are your New Year Resolutions?" Then comes an increasingly common reply which sounds either like "I have resolved not to make any more New Year Resolutions," or "My New Year resolution is not to make any more New Year resolutions." Such statements are increasingly "same old, same old." As I was thinking about how more people are giving up the making of any resolutions altogether, I cannot help but wonder whether resolutions themselves fail not because of a lack of resolve, but for a lack of realism. Last year, I listed five New Year resolutions for my readers to consider. This year, I want to follow up with another five. They are not exactly new, but are some that we can all ponder and maybe embark upon. It is more important to make a small number of good resolutions instead of too many frivolous and impossible ones. 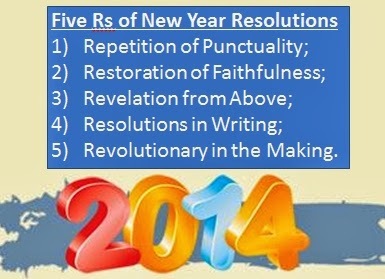 I call it the 5Rs of New Year Resolutions. They are the Repetitions of punctuality; the Restoration of our commitment to promises made; Revelation from above; Resolution written down; and finally to participate in a spiritual Revolution. The first two can be done immediately. The next three require the disciplines of waiting, of pondering, wondering, and empowering. In order to make any resolution stick, it needs to be Specific, Measurable, Achievable (or Attainable), Realistic (or Relevant), and Timely. This is also called SMART in many management circles. However, when it comes to spiritual matters, the SMART paradigm does not work as well. So this article will put forth two practical resolutions that meet the SMART requirements and three spiritual ones that help us wait, wonder, and be waken up by God. I started the year by recommending just one for my Church: Be punctual each Sunday. I think punctuality is something that is important enough for all, simply because being punctual is a mark of respect not just for fellow worshippers each Sunday, but also the recognition that if God is punctual, why should we then be late? After all, in concert halls and performance theatres, it is a common practice to turn away latecomers lest they interrupt the performances on stage and disturb the patrons trying to enjoy the show. This meets the SMART requirements as it is a specific item without ambiguity. It is measurable and very achievable as well. Not only that, knowing what time the service starts gives us added advantage to plan for it. It is also timely as the increase of punctuality is a needed corrective to any culture's tendency to take the Sunday service for granted. It is also not enough just to be punctual once. We need to repeat this practice over and over until it becomes a habit. Let this habit become a lifestyle. Let this lifestyle then build a character. Apart from this resolution to be punctual, I thought about the need even to make new ones. Why don't we just be faithful with the old ones we have made. That should keep us busy enough. Be kind to your colleagues. Greet your neighbours. Say hello with a genuine smile. Love our spouses. Honour our parents. Respect authority, and so on. If we spend all of our time trying to fulfill our past promises, we will not have any time to worry about making new ones. Why make new ones when there are already good old ones that need us to be responsible about? This resolution #2 may seem to be some kind of an "anti-resolution." That need not be so, as many people need something positively framed in order to avoid being trapped in an "out of sight; out of mind" situation. Just take marriages for example. Perhaps, this year, couples can renew their vows. Neighbours can start noticing one another as people in the same community rather than inconvenient strangers. Be a faithful worker in the office or workplace, as it is still very much a commitment to what we have signed in our employment contracts or agreements. So what if we do not get our expected salary increment this year, especially when it does not alter the very specific contractual obligations we had previously signed. Just because our colleagues get a bigger slice of the pie does not mean we can go around throwing tantrums by complaining and moaning about inequity. If something really gets on our nerves and inhibits our work, perhaps the best resolve then is to quit. Better throw in the resignation letter than to poison our souls through bitterness and a complaining mentality. One of the most intriguing events in the Book of Acts occur right at the beginning of the Early Church. As the disciples witness the resurrected Jesus, and watch Jesus disappears into the clouds, they must have been excited about the great commission. Surely, they can abandon whatever little concerns in their personal lives and be energized toward the greater concerns of the kingdom of God. Yet, in Acts 1, we read about them being asked to wait for a special revelation from heaven. In particular, the disciples are to wait for the coming of the Holy Spirit. They must wait for the gift. The early disciples must have been wondering about exactly what kind of gifts to expect. Perhaps, we might be wondering whether they are like our modern little children wondering what kind of gifts Santa Claus has in store for them each year. Maybe, we thought that they are concerned about some kind of presents to help make their ends meet. No. They were told specifically to wait for the Holy Spirit who will teach them all things. Such waiting is something increasingly foreign to us in our achievement-oriented and materialism-infatuated society. Modern consumerism has taught us that possessions matter and quantity matters even more. More money means more happiness. More things means more joy. The Walmart slogan captures the modern culture very well: "Save Money. Live Better." What the early disciples were hearing are very different. Wait for the gift of the Holy Spirit, and the rest will be revealed unto you. Instead of plunging ourselves into work and non-stop activity, why need observe periods of silence and solitude. Take time to be holy. Make space to let the gaps inform us of the connections between the various islands of activity. The use of spaces to separate words makes for clarity and readability. The use of pauses in speeches makes for listen-ability. The use of silence between notes makes for a pretty melody. This video of how the tune to "Joy to the Word" is highly instructive. We all need a revelation. With each revelation, there needs to be a waiting and receptive heart. What good is a resolution if it is not put down in writing. This is another way to keep ourselves accountable. When things are put down in writing, it carries with it a certain commitment. A story was told of a PhD student deciding to argue against his professor for insisting on the need for references and written scholarship. "Why must I depend on citing the sources and the published materials? Why can't I just verbally say, 'The elevator boy tells me this,' or 'My mother tells me that,' and we get our qualifications?" Gently the Professor then replied. "Ok. Then, let me just say, this institution will now give you your PhD. We will not give you any written documents or degree scrolls. You just have to take our verbal words for it." It is one thing to just say something. It is yet another to have something written down. Remember how often Jesus cites the Old Testament with the word, "It is written?" We all need a revival, a renewal, and for some, a revolution of our own lives. Call it a breakthrough or a new beginning. We can even call it a conversion or an active response to a personal epiphany. Think about John Wesley's heart strangely warmed experience at Aldersgate on May 24th, 1738. Or about Martin Luther's remarkable challenge to the Roman Church authority in his nailing of the 95 theses at Wittenberg in 1517, or that one moment that changes the heart of John Newton that sparked off "Amazing Grace." As long as we are open to the revelation from heaven, to be ready for the gift of the Holy Spirit, and to respond gratefully to the promptings the Spirit makes, we easily become a revolutionary for God. In his powerful book, Soul Making, Professor Alan Jones connects revelation with revolution. With revelation comes a need to response. This response is in fact a revolution in the making. He writes with penetrating wisdom. My readers. Consider any of the 5Rs above and choose one that you can do now and another that you can do later. For starters, let me suggest #2 (restoration of faithfulness) and #3 (Revelation from above). The first is a reminder to keep our promises made, and to keep on fulfilling them. The second is a call to be open to God's revelation. This also means cultivating a prayerful heart, and reading the Scriptures prayerfully. God's gift is open to us. Are our hearts open to God? Can Anyone Live Without God?